The Full Moon is Friday April 19. 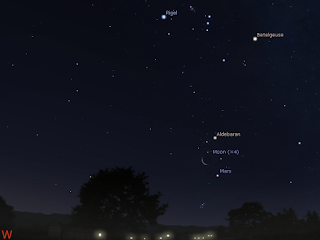 Mars is visible low in the evening skies and is close to the Hades cluster. 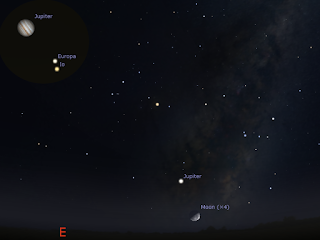 Jupiter is low in the late evening skies and is visited by the Moon on the 23rd. 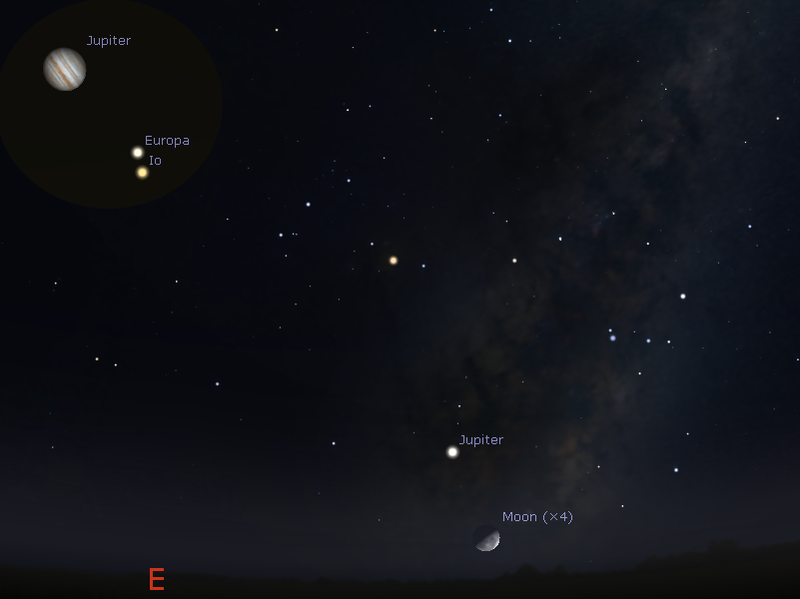 The morning skies feature four bright planets Jupiter, Saturn, bright Venus and Mercury. Saturn enters the evening sky and is occulted by the Moon as seen from eastern and parts of central Australia on the 25th. The Full Moon is Friday April 19. 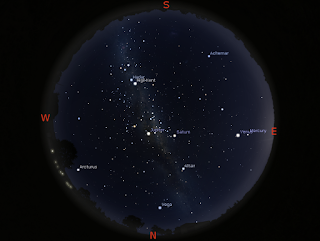 Morning sky on Saturday, April 20 showing the whole sky as seen from Adelaide at 5:47 ACST (60 minutes before sunrise). Four bright planets can be seen. Jupiter and Saturn are high above the northern horizon. Venus and Mercury are above the eastern horizon. The Moon is above the northern horizon. Similar views will be seen elsewhere in Australia at the equivalent local time (60 minutes before sunrise). Sky at 23:00 ACST on Saturday, April 20 looking east as seen from Adelaide. Jupiter is low above the eastern horizon. The left upper insert inset shows the telescopic view of Jupiter at this time. The Moon is a finger-width from Jupiter. Io's shadow is on the surface of Jupiter, and Io will shortly transit Jupiter itself. Similar views will be seen elsewhere in Australia at the equivalent local time. The view of the Moon facing east at 22:48 am ACST in Adelaide on Thursday 25 April just as Saturn appears from behind the Moon. The moon is close to the horizon. Similar views will be seen elsewhere in eastern Australia at roughly the equivalent local time, detailed times and observation hints are at my Saturn occultation page. The Hyades also grace the north-western sky. Mars is close to the Hyades and the bright red star Aldebaran. Venus is bright in the morning skies below Jupiter and Saturn and above Mercury. Mercury away from Venus over the week. Mercury is now sinking in the morning sky but is still visible below Venus as it leaves Venus behind. Jupiter Jupiter is now rising just before midnight in the evening sky, but is low to the horizon and not a good telescope target until the morning. Jupiter is close to the Moon on the 23rd. Mars moves through Taurus and is the brightest object in low in the western evening sky. Mars sets around 7:30pm. Mars is close to the Hyades and the bright red star Aldebaran, heading towards the horns of the Bull. Saturn is climbs higher in the morning sky. It is in an excellent position for telescopic viewing in the early morning. By mid week it has entered the evening sky, on the 25th the Moon occults Saturn as seen from eastern and parts of central Australia. The Moon, although low above the eastern horizon, is a very obvious signpost for where to look but for most locations Saturn is behind the Moon as it rises (or the pair are very close to the horizon just before the occultation starts). Adelaide, Townsville and Rockhampton all have the Moon very close to the horizon, so you will need an unobstructed eastern horizon to see the occulation. Start watching about half an hour beforehand to get set up and familiar with the sky. Saturn will appear from behind the dark limb of the Moon while still low above the horizon, so will be a difficult telescopic target. Reappearance will be hard to see as you have to be looking just at the right moment. More cities in Australia and New Zealand cities can be found at the IOTA site (UT times only). Although this can be viewed with the unaided eye, it is better viewed with binoculars or a telescope. Unfortunately, the occultation is low to the horizon in many places, so large telescopes may not be able to point that low. You sill will be able to enjoy it. 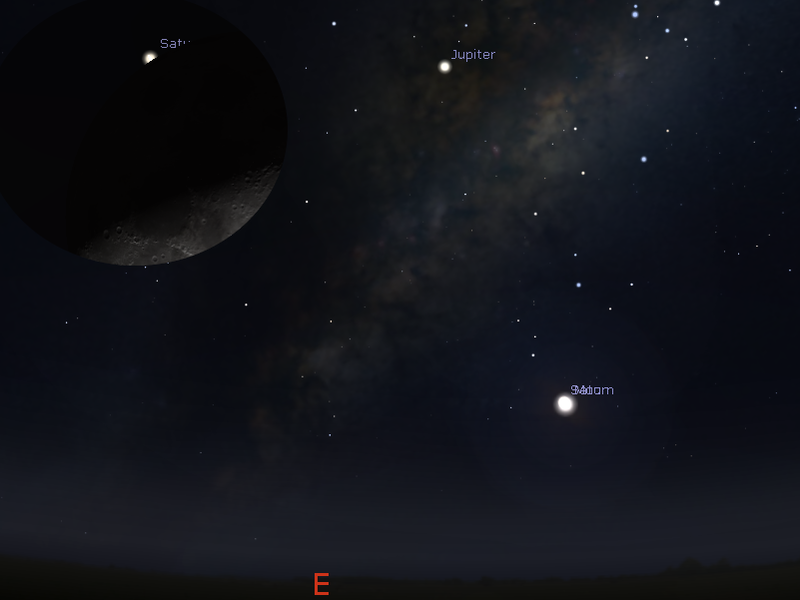 There are two more occulations of Saturn visible from Australia this year, in August 12 (eastern Australia) and September 8/9 (Northern and Western Australia). The First Quarter Moon is Saturday April 13. Mars is visible low in the evening skies and is close to the Hades cluster making a second eye for Taurus the Bull. 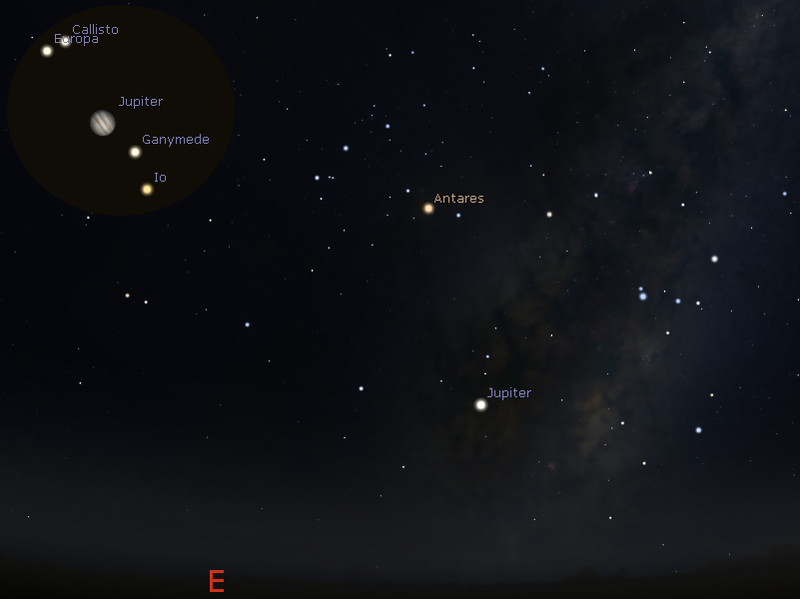 Jupiter is low in the late evening skies. 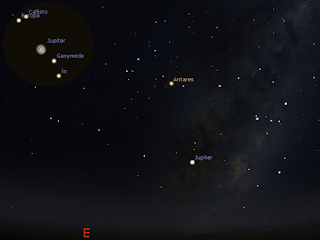 The morning skies feature four bright planets Jupiter, Saturn, bright Venus and Mercury. Venus and Mercury are closest this week on Wednesday the 17th. The First Quarter Moon is Saturday April 13. The Moon is at perigee on the 17th. 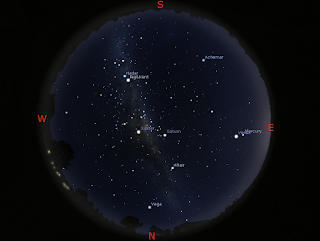 Morning sky on Saturday, April 13 showing the whole sky as seen from Adelaide at 5:42 ACST (60 minutes before sunrise). Four bright planets can be seen. Jupiter and Saturn are high above the northern horizon. Venus and Mercury are above the eastern horizon. Similar views will be seen elsewhere in Australia at the equivalent local time . The Pleiades and Hyades also grace the north-western sky. 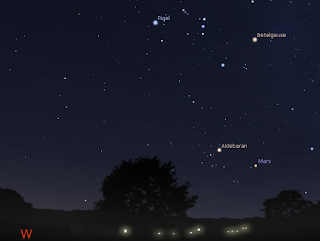 Mars is close to the Hyades and the bright red star Aldebaran, forming a second eye for Taurus the Bull. Venus is bright in the morning skies below Jupiter and Saturn and above Mercury. Mercury moves closer to Venus over the week and is closest to Venus on the 17th. 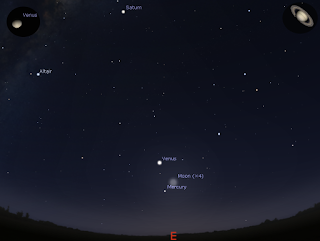 Mercury climbs higher in the morning sky and is visible below Venus and is closest to Venus on the 17th. Jupiter Jupiter is now rising just before midnight in the evening sky, but is low to the horizon and not a good telescope target until the morning. 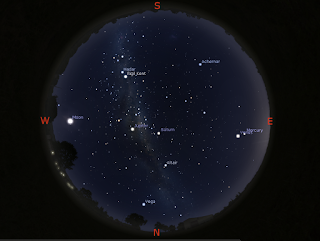 Mars moves through Taurus and is the brightest object in low in the western evening sky. Mars sets around 7:30pm. 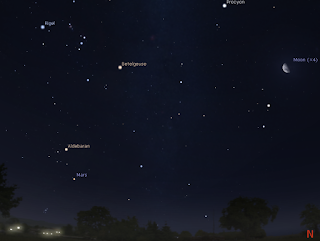 Mars is close to the Hyades and the bright red star Aldebaran, forming a second eye for Taurus the Bull. Saturn is climbs higher in the morning sky. It is in an excellent position for telescopic viewing in the early morning. 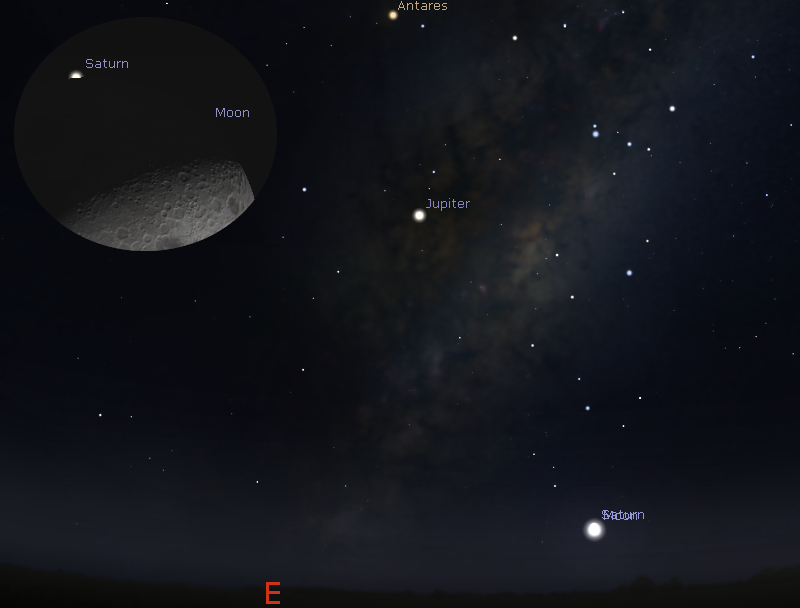 The New Moon is Friday April 5. Daylight saving ends on the morning of the7th. 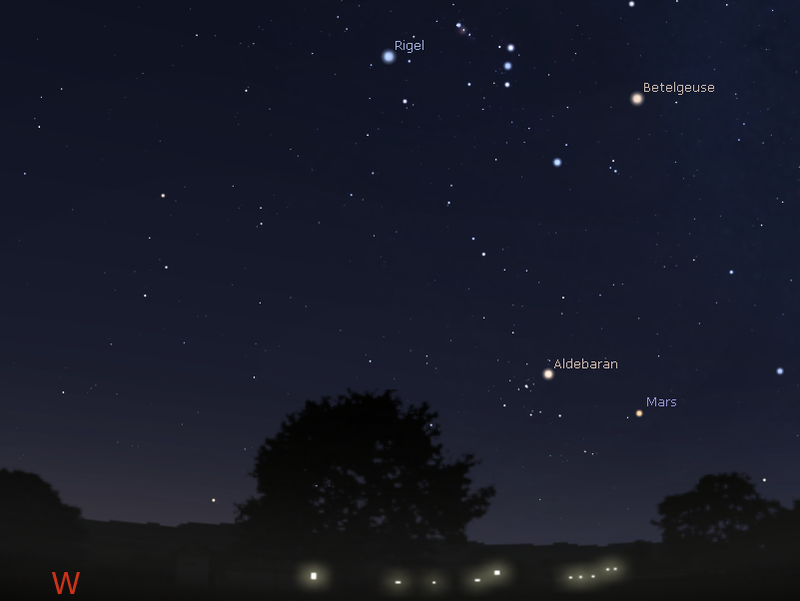 Mars is visible low in the evening skies and is close to the Pleiades cluster. The crescent Moon is close to Mars on the 9th. 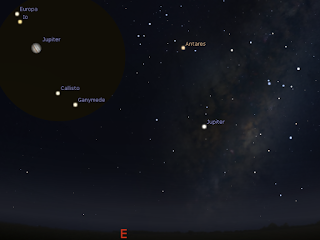 Jupiter is low in the late evening skies. 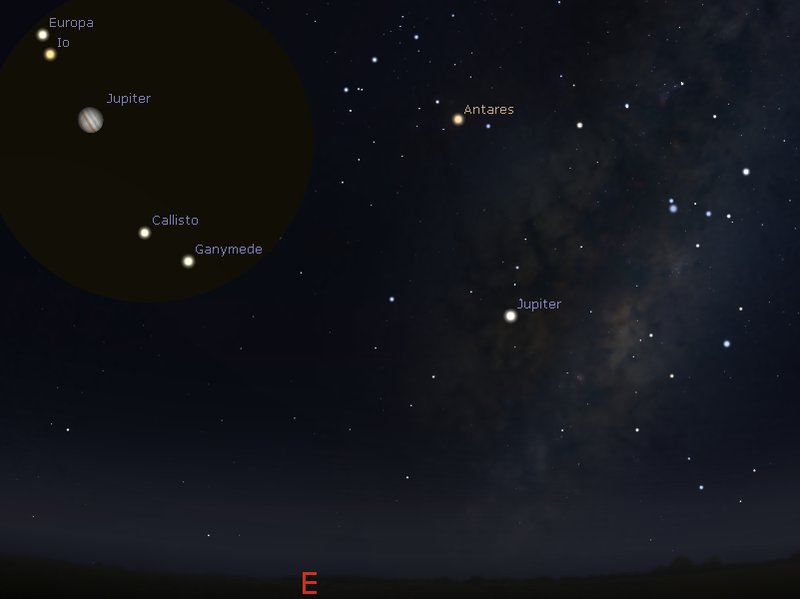 The morning skies feature four bright planets Jupiter, Saturn, bright Venus and Mercury. Venus and Mercury come closer over the week. The New Moon is Friday April 5. 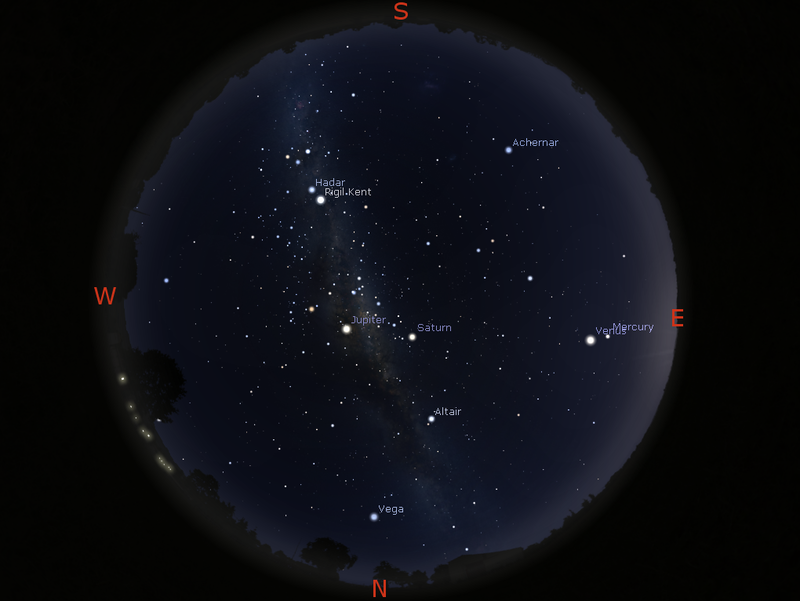 Morning sky on Sunday, April 7 showing the whole sky as seen from Adelaide at 56:37 ACDST (60 minutes before sunrise). Four bright planets can be seen. Jupiter and Saturn are high above the northern horizon. Venus and Mercury are above the eastern horizon. Evening sky on Tuesday, April 9 as seen looking north-west from Adelaide at 18:55 ACST (60 minutes after sunset). Mars is the brightest object above the western horizon just below the crescent Moon. The Pleiades and Hyades also grace the north-western sky. Mars is still close to the Pleiades at the beginning the week then moves closer to the Hyades. Venus is bright in the morning skies below Jupiter and Saturn and above Mercury. Mercury moves closer to Venus over the week. 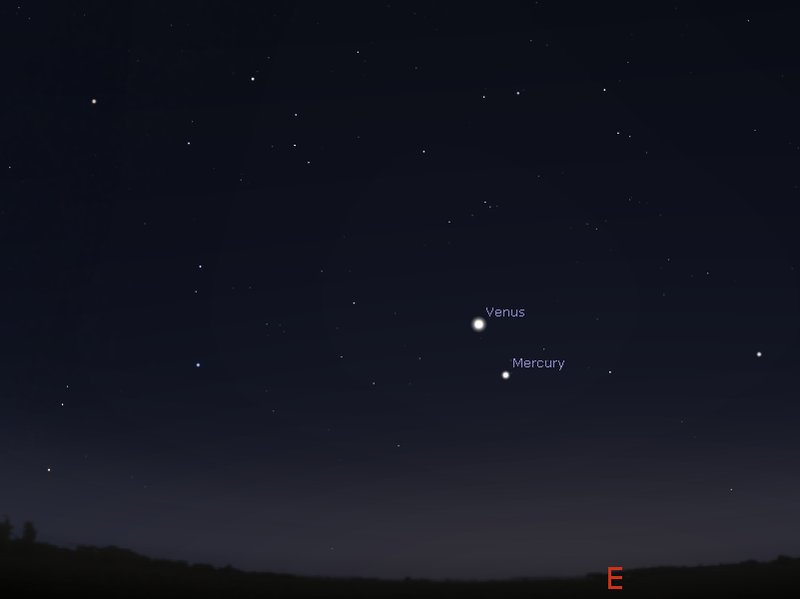 Mercury climbs higher in the morning sky and is visible below Venus. Mars moves through Taurus and is the brightest object in low in the western evening sky. Mars sets around 8:00pm. Mars is still close to the Pleiades at the beginning the week then moves closer to the Hyades. Mars is close to the crescent Moon on the 9th. Saturn is climbs higher in the morning sky.In is in an excellent position for telescopic viewing in the early morning. The Moon facing east at 22:48 am ACST in Adelaide on Thursday 25 April just as Saturn appears from behind the Moon. The moon is close to the horizon. Similar views will be seen elsewhere in eastern Australia at roughly the equivalent local time, detailed times are here. Mercury climbs higher the morning sky band is close to the crescent Moon on the 3rd..
Venus is high in the morning skies and is close to the crescent Moon on the 2nd. Mercury and Venus are close on the 17th. 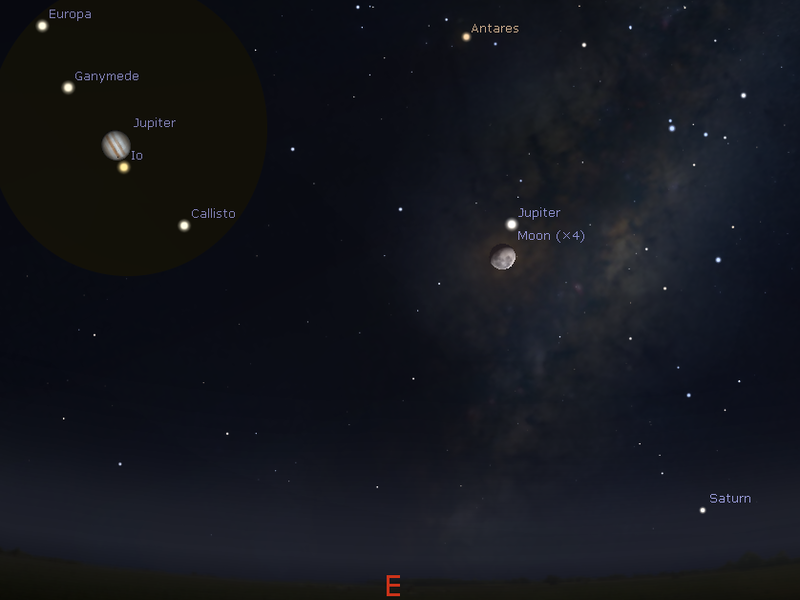 Jupiter is close to waning Moon on the 23rd. 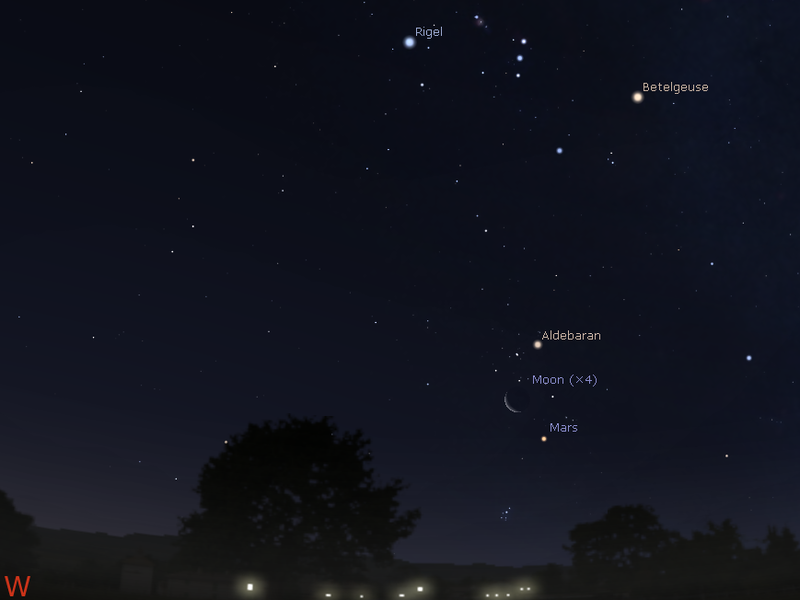 Mars is close to the crescent Moon on the 9th. Saturn climbs higher in the morning sky and enters the evening sky late in the month. April 25; crescent Moon close to Saturn, occultation. April 9; Mars close to the cerscent Moon. April 25; waning Moon close to Jupiter. April 25; crescent Moon close to Saturn, occultation. The Last Quarter Moon is Thursday, March 28. 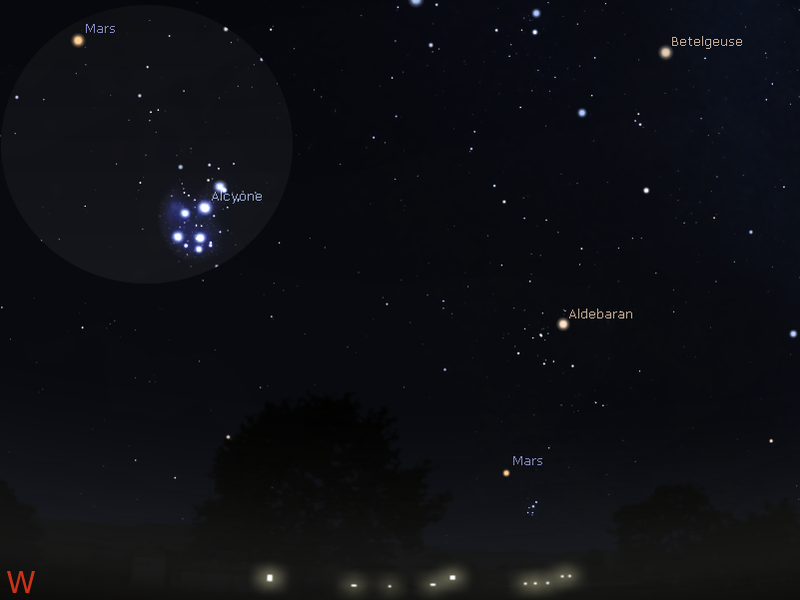 Mars is visible low in the evening skies and is in binocular range of the Pleiades cluster being best around the 31st. 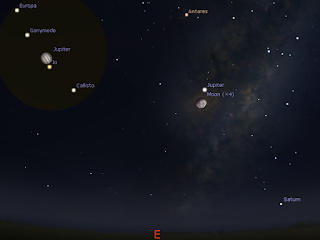 Jupiter enters the evening skies and is close to the Moon on the 28th. 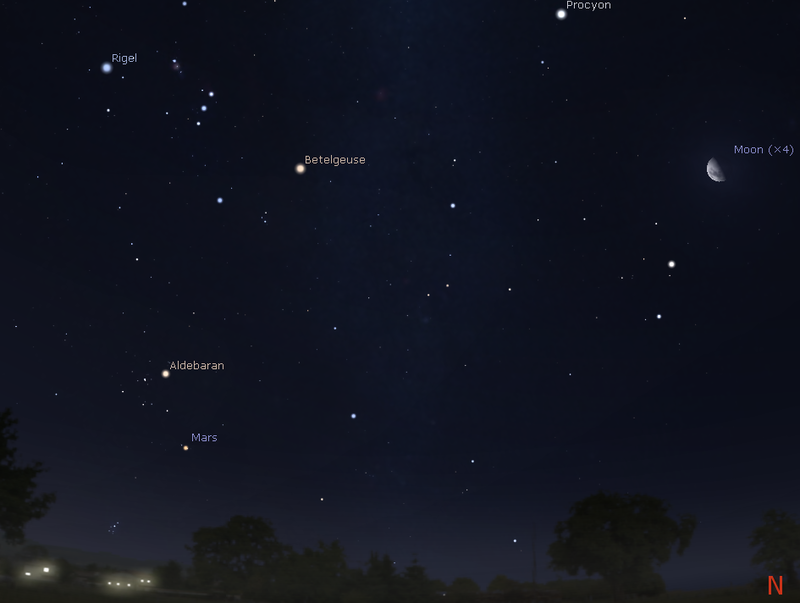 The morning skies feature Saturn, bright Venus and Mercury. The crescent Moon is close to Venus on the 2nd and close to Mercury on the 3rd. The Last Quarter Moon is Thursday, March 28. The Moon is at apogee, when it is furthest from the earth, on the 1st. Morning sky on Wednesday, April 3 looking east as seen from Adelaide at 6:36 ACDST (60 minutes before sunrise). Jupiter (out of view in this images) is high in the morning sky above Saturn, Venus and Mercury. The crescent Moon is between Venus and Mercury. The left upper insert inset shows the telescopic view of Venus at this time and the upper right that of Saturn. Evening sky on Sunday, March 31 as seen looking north-west from Adelaide at 20:36 ACDST (90 minutes after sunset). Mars is the brightest object above the western horizon. The Pleiades and Hyades also grace the north-western sky. Mars is close to the Pleiades over the week and is within binocular distance most of the week, being closest from the 29th to the 1st. Venus is bright in the morning skies below Jupiter and Saturn. It is visited by the crescent Moon on the 2nd. 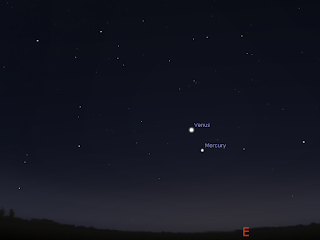 Mercury climbs higher in the morning sky and is visible below Venus. On the 3rd the thin crescent Moon is close to Mercury. Jupiter Jupiter is now rising just before midnight in the evening sky, but is low to the horizon and not a good telescope target until the morning. Jupiter is close to the last quarter Moon on the 28th. Mars moves through Taurus and is the brightest object in low in the western evening sky. Mars sets around 9:30pm. Mars is close to the Pleiades over the week and is within binocular distance most of the week, being closest from the 29th to the 1st. Saturn is climbs higher in the morning sky. 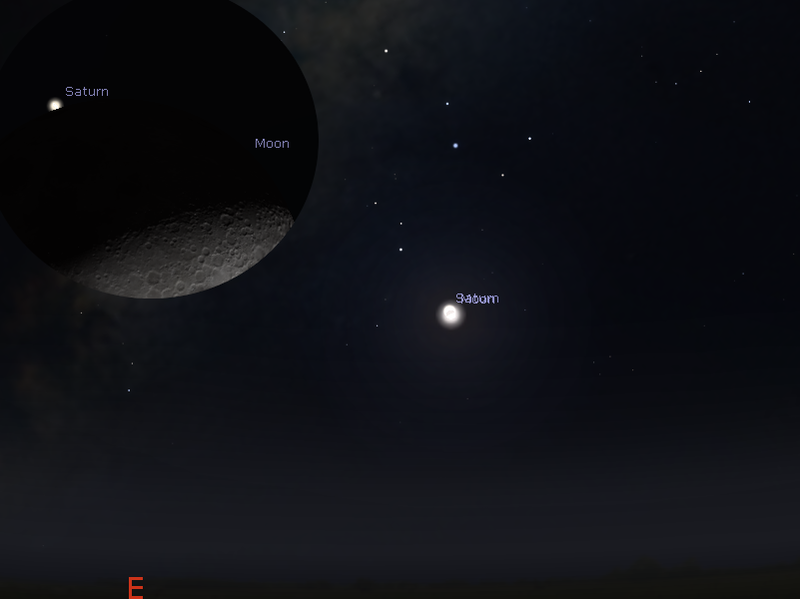 The Moon is close to Saturn on the 29th and 30th. 2 x Zoom, ASA 400 1/4000 sec exposure. 4" Newtonian. Scaled full frame image. Click to embiggen. 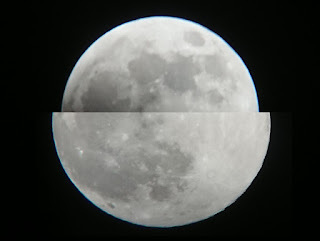 Comparison of the 21 March 2019 perigee "super" Moon (bottom) with the apogee "Mini Moon" on the night of Total Lunar Eclipse of 28 July, 4:25 am. Sony Xepria 1/2000th sec exposure ASA 400. Note the minimal (but still obvious) difference in size between the two (same image scale and zoom factor) compared to the 20 February image. Click to embiggen. Comparison of the 21 March perigee Full Moon (bottom) with the 20 March Moon, this was closer to perigee by about 24 hours but one day before full.. Sony Xepria 1/4000th sec exposure ASA 1600. Note the clear difference in size between the two (same image scale and zoom factor) compared to the 21 March image. 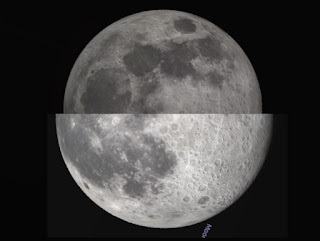 Comparison of the 20 February perigee "super" Moon (bottom) with the apogee "Mini Moon" on the night of Total Lunar Eclipse of 28 July, 4:25 am. Sony Xepria 1/2000th sec exposure ASA 400. Note the clear difference in size between the two (same image scale and zoom factor). Comparison of the stellarium simulation of 20 February perigee "super" Moon (bottom) with the apogee "Mini Moon" on the night of Total Lunar Eclipse of 28 July, 4:25 am. Same image scale and zoom factor. The agreement between predicted and observed is quite good given the limitations in manually aligning the files. 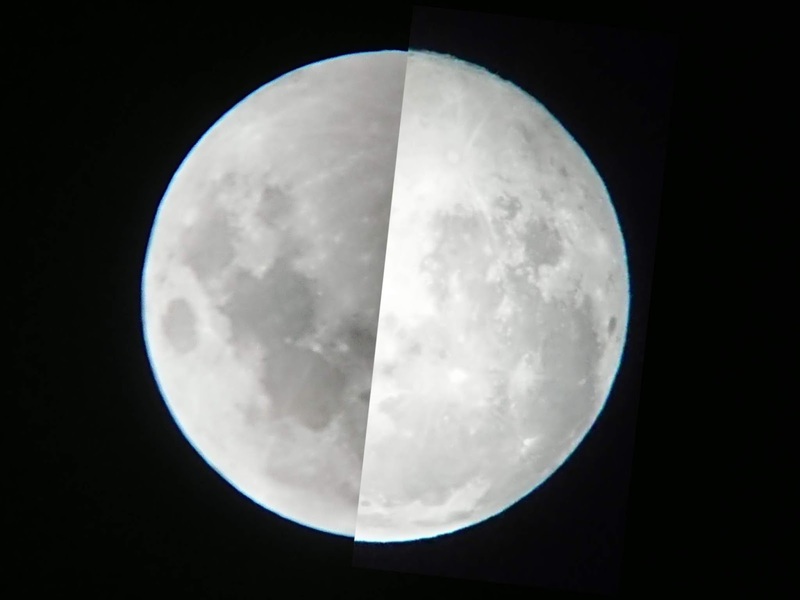 I know you have been hanging out for this, so here are my shots of the almost perigee (sort of "super") moon of 21 March, and compared them to the shots from the 20 February perigee Moon. There is a subtle difference between the 21 March and the 28 July apogee Moon of 2018, unlike the more obvious difference between 20 February. and 28 July. You can see the comparison with the 21 January preigee Moon here. The 20 February Full Moon was 6 hours from perigee, while the March 21 one was 29 hours from perigee (an the 21 January one 14 hours from Perigee). I also have included a comparison between 20 March (1 day before full Moon and closer to perigee) and the 21st March full Moon. I have also included a comparison between the 20February 28 July perigee/apogee pair and the stellarium prediction. Now to wait for the September 13 Apogee Moon.